Slowly building the hard rock/pop metal momentum that reached its height in the mid ‘80s, Whitesnake finally hit pay dirt with their self-titled 1987 album its sound on the album is typical of the arena rock era: lightning speed guitar, bombastic drumming, orchestral synths—with melodic hooks aplenty and David Coverdale’s gritty vocals. Whitesnake’s biggest hits, naturally, were the ballad “Is This Love” and the iconic rocker “Here I Go Again” (which is actually a remake from an earlier Whitesnake album). Those tracks alone stamped Whitesnake’s reputation forever, but there is also some perhaps overlooked songs from the album such as the heavy numbers “Still of the Night” and “Children of the Night,” and another power ballad “Looking for Love.” It may not impress those folks who look at the ‘80s as a period of excess—and the sound is over the top–but Whitesnake is an essential cornerstone work of the metal era. 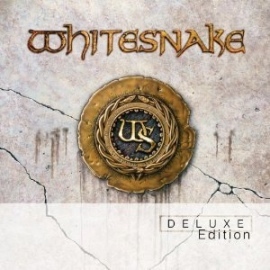 The DVD portion of the reissues features recent live performances of the some of the album’s tracks along with the famous videos of “Here I Go Again” and “Is This Love,” featuring Coverdale’s then-paramour Tawny Kitaen.